Wholesaler of leather goods that include mens leather belts, womens leather belts, designer leather belts, fashion leather belts, formal belts, casual belts, vintage belts, weave belts, embossed belts, punched belts, webbing belts. Manufacturers and exporters of leather products like leather bags, ladies leather bags, leather wallets, leather purses, leather clutches, leather credit card holders, leather passport holders, leather planners, leather portfolios and leather cases. Leading manufacturers and exporters of leather goods and accessories such as leather belts, leather bags, suede leather belts, leather wallets, black leather belts and leather purse. Leading manufacturer and exporter of leather goods and accessories like leather wallets, ladies leather wallets, gents leather wallets, leather card holders, leather clutch purses, leather multi card cases and leather credit card wallets. Manufacturing and exporting of leather goods such as leather belts, high plains drifter leather belts, men's leather belts, leather fashion belts, crackle leather belts, stitched leather belts, latest leather belts, crackle-belts and hoggs leather belts. Manufacturer and supplier of leather garments that includes leather jacket, ladies leather jacket, men leather jacket, finished leather jacket, leather coat. Manufacturing and exporting of leather garments of men and women such as leather coats, ladies leather dresses, leather long coats, leather overcoats, leather trench coats, leather jackets, men's leather coats, leather trousers and leather jeans. 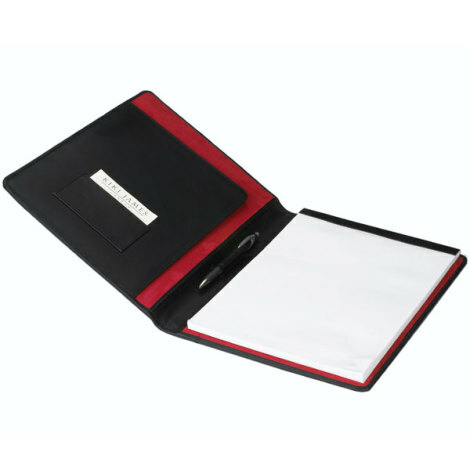 Conference Leather Folder Item Code:PC011 Our range of conference leather folders are available in various sizes. We under take bulk orders with various patchwork as per client's brand names.